I entered the trail at 7:30 in the morning. June 10th, alone on this trail, naturally, as the song lyrics went. The morning was warm and comfortable. Mosquitoes and flies were absent. Almost perfect. Perfect would have been to not be alone, and to encounter all NEW butterflies. Soon, these tiny hairstreaks (Lycaenidae) were here, then there, then there, too. Looked like Leps back in Pennsylvania, until I approached. Bingo! New! New to Jeffrey! Had not seen these at the base of Mt. Hermon (closed because of War! on the north face of the mountain = Syria 2013), not seen at SPNI Hermon or at the several sites I explored nearby. New! My film Canon camera got a workout. Pop! Pop! Pop! I worked A. Cilissa, shooting lots and lots of exposures. Hand-held and a butterfly that is almost always moving as it nectars but in the first ½ hour that I worked those trails, I met several males enjoying the morning, as the male is doing in the image before you. Why, because as with most butterflies, their night roosts are cool, and to get a good morning’s start that includes nectar and patrol for mates, they need to warm up. Flying without warming up could mean flying a reduced speed, and that could mean disaster if chased by a bird, or ambushed by a spider hiding in a blossom or by a Mantid frozen in place near blossoms. Is that fellow not handsome with a capital H? A dandy with bright lit wing oranges, black spots rakishly arranged, intact wings with understated white borders, talk-of-the-town striped abdomen, well-turned antennae and those 2 pairs of tails. Can you imagine how much he accomplished that very morning? May all of us have a Happy and a Healthy New Year. 2014! OMG! And may you resolve to ‘Like’ when you like and ‘Comment’ so that Jeff can know that you stopped by. Back again with our shy, but determined Apharitis cilissa female, not alone on this SPNI Mt. Meron trail. We had hundreds of other butterflies, of many, different species here there and everywhere around us. Determined to capture dorsal (upper) and ventral (lower) wing surfaces, I shot away, with near total abandon. Because when she was nectaring, she would occasionally move her wings, as many hairstreak butterflies do. Each time she did, the spectacular orange of her upper wings would peek out. Wow! I loved the provocative burnt orange. Nothing within 100 feet could match its bravado! So, after pitching quite a few ehh! slides into the dust bin, here’s one that we can share. My Canon camera’s built-in photometer failed on me, so my work on Mt. Meron was done. All’s well that end’s well. Once again, this is a protected species, flies only 1 month a year, and is found only in the vicinity of Mt. Meron. Happiness is different things for different people. Comments are welcome and encouraged. Funny how our previous post of this perky! 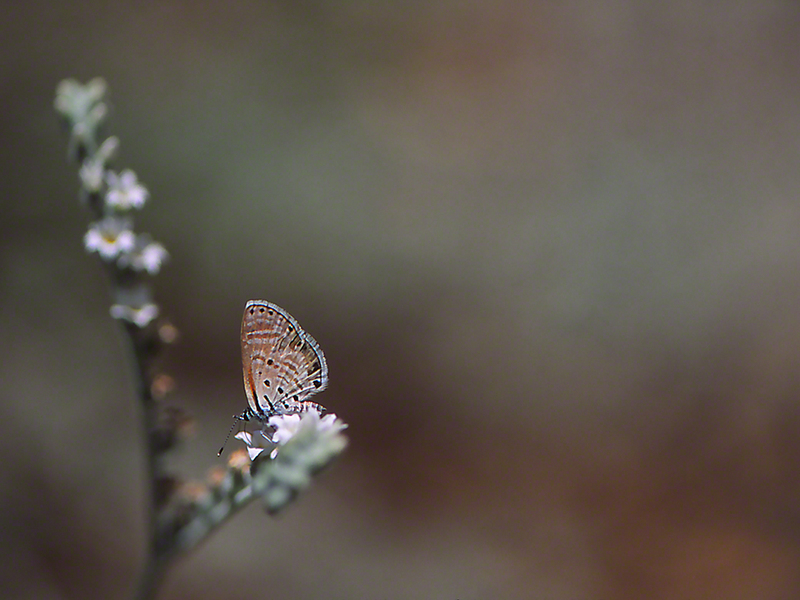 little Hairstreak, encountered on Mt. Hermon in Israel, met with much interest from Israeli lepidopterists but not so from our broader audience? Pity, because she is just gorgeous, don’t you think? I made great effort to capture the silvery shine when the sun struck those hindwing spots, but you see I was only partly successful in that. What is nice here is the crisp, likable coloration and spotting of the ventral (below) wings. Her 2 pairs of tails are seen, too. Bulbous abdomen and that pose, so reminiscent for me of dogs set-up in the ring at Westminster Kennel Club’s annual dog show in New York. This rare, protected species, so serendipitous for me (remember, right place, right time on the mountain = Yay!) 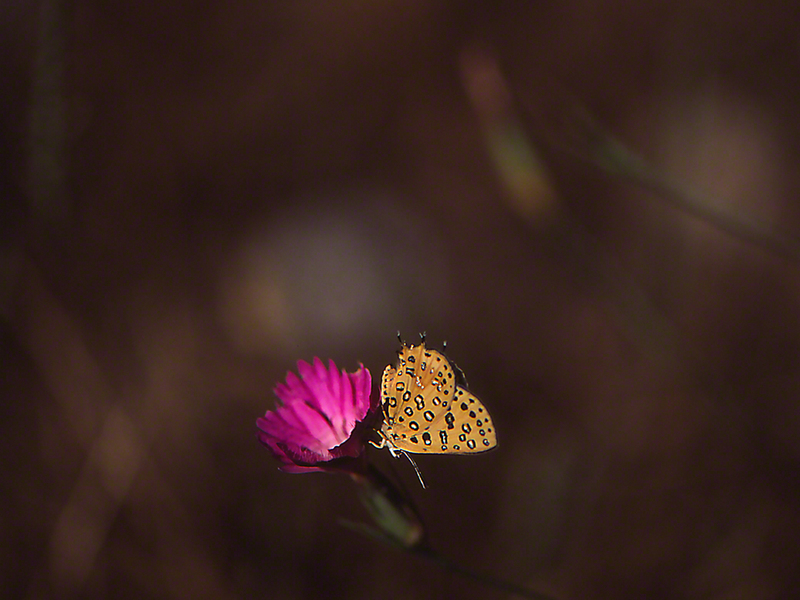 on a Centaurea, or what could it be? I am now reading Nabokov’s Butterflies (edited and annotated by Boyd & Pyle). Excerpts from an exchange of letter between Jerusalem‘s Teddy Kolleck and Nabokov, in 1976, encouraged me. Nabokov (the renowned author and distinguished student of butterflies) wrote, “I have been eager for quite a time to make this journey [to Israel] bad time for me. I have been hospitalized for several months. I would like to come with my wife in the second week of May. I am also looking forward to, of course, some butterfly collecting (in the company of an experienced and robust male guide).” He was never able to join the millions who are fortunate enough to make this trip each year. Vladimir Nabokov died in 1977. Can you imagine seeking butterflies on Mt. Meron or Mt. Hermon, with a Vladimir Nabokov? My field trips are solitary ones. Although I have never enjoyed such an experience, at the same time I miss the opportunity. Of course I only photograph. I have swung a net once, and it didn’t suit me. Our knowledge of butterflies, for example of the blues (Nabokov’s most fervent pursuit), is largely due to the butterfly net, though. I was fortunate enough to visit Israel and its 2 northern mountains. Good. Quite good. Backwards. Backwards for me, at least. June 2013 and I am booked in quarters at SPNI‘s Mt. Meron field house. Good. 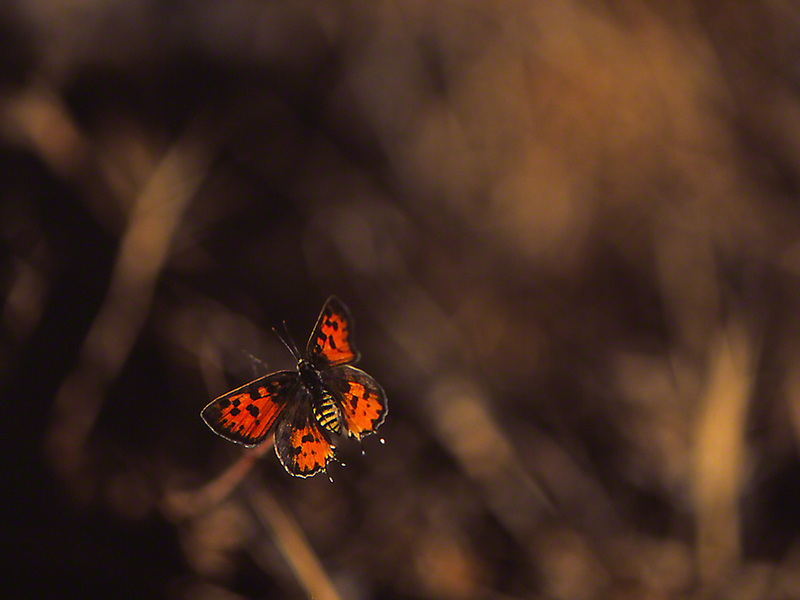 several days to photograph butterflies on this very special mountain at the tippy top of north central Israel. I began working the trails in the SPNI’s own natural reserve. Apharitis cilissa greet me along much of the trail. Hmm, they do resemble Apharitis m. (already posted in winged beauty), but no, they are not the same species. The spotting here is not as bold, they are fewer in number, and they do not connect as a necklace of spots. Very good. A new species of Israeli butterfly. Taddah! There were many of them. Flying low, the males, as we see here, perch often, and hold their perch. Tough guys, ey! Females were skittish and flew away into nearby growth, with little provocation. 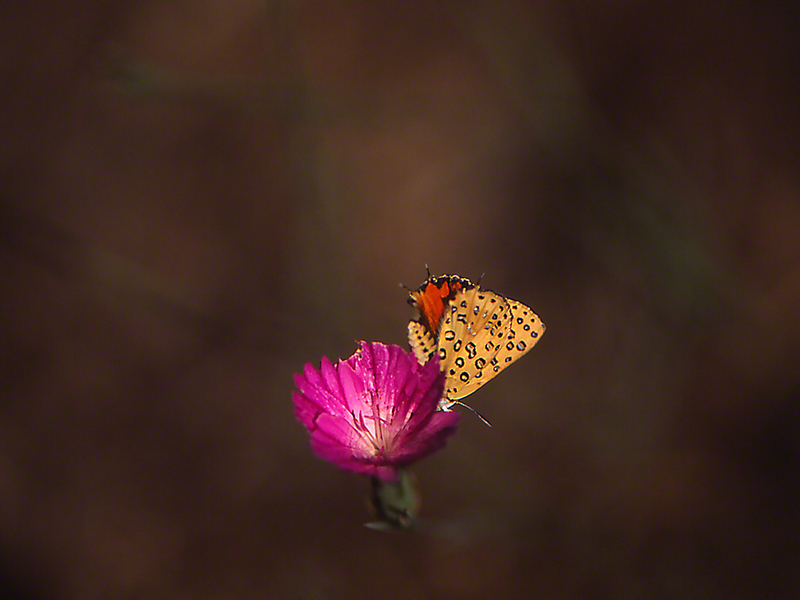 Apharitis species are among those fascinating butterflies whose caterpillars have protection. They are tended by, and guarded by ants. Can you imagine? Nurseries under the watchful eye of tiny wiseguys (think Capone, Gotti, et al). So why backwards? 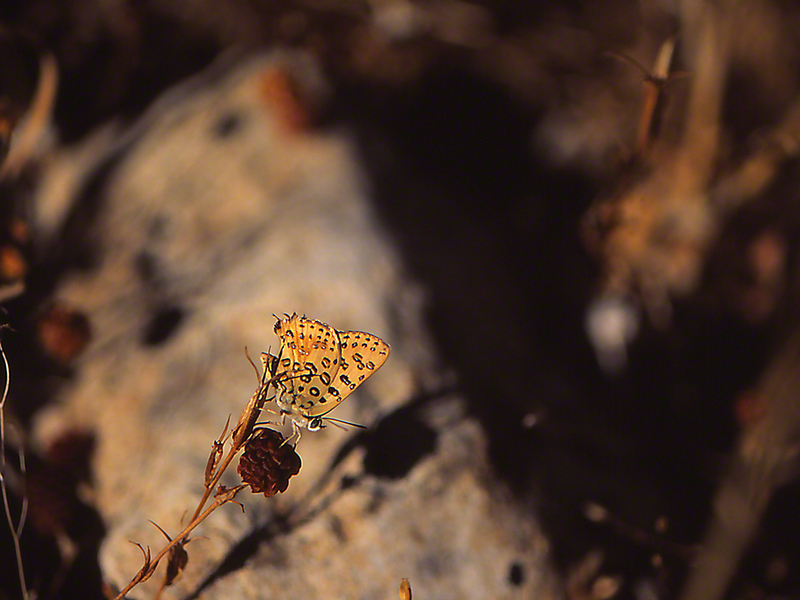 After seeing dozens of these little beauties, with the silvery centers of those spots that at just the right angle, shining silvery in the sun, I concluded that this was a common butterfly, seen throughout at least the north of Israel (and Lebanon, but who can know about that, considering the current situation). Went to my Israeli field guides. No, no. A protected species! What! Yes a species found only in a very limited area, that is, where I was. And when do they fly? June and only June. Thank You! Right place, right time. And when the sun strikes their wings at just the right angle! A protected Hairstreak! Happy days are here again. Yes it doesn’t take much to pop a big smile on my face.